The Glacier Point Road offers a variety of trails, with paths leading to granite peaks, to overlooks of Yosemite Valley, through forest and meadows, or along mountain streams. Two of the best short trips are to Taft Point and Sentinel Dome; most other paths are long routes that lead into the backcountry to the south and east, and link with other trails for overnight trips. The Yosemite Valley and Glacier Point Hiking Map shows the location of each trail. 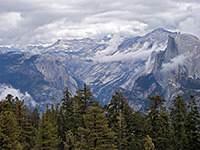 Other Yosemite trails: Mariposa Grove and Wawona, Tuolumne Meadows and Tioga Road, Yosemite Valley. Bridalveil Creek 9 1,600 This backcountry trail begins along the Glacier Point Road a mile east of Bridalveil Creek and for the most part encounters thick pine forest, crossing several drainages and junctions with other paths, before climbing to a highpoint north of Chilnualna Creek. Here the woodland is replaced by open, granite slopes for half a mile, before the path re-enters the forest and ends with a steep descent to the creek and Chilnualna Fall, where the Bridalveil Creek Trail meets another path from Wawona. Buena Vista 13 3,000 Starting a mile down the Panorama Trail from Glacier Point, the Buena Vista Trail is one of the main long distance paths in the south of Yosemite National Park, climbing steadily along the sparsely-forested valleys of Illilouette Creek and Buena Vista Creek to a high Alpine region of small lakes and much exposed granite beneath 9,709 foot Buena Vista Peak. From here two other paths lead further south. Four Mile 4.8 3,240 One of two steep paths that climb the south side of Yosemite Valley to Glacier Point, the Four Mile Trail ascends the side of a ravine between Sentinel Rock and Moran Point, for superb views up and down the valley, and of Yosemite Falls opposite. The trailhead is on the Southside Drive near the bridge over Sentinel Creek, and the upper end is the parking area at the end of the Glacier Point Road, which, like the trail, is closed in winter. The round trip makes for a moderate day hike, though an easier option is to do the hike one-way (downhill), with either a car shuttle or using a tour bus (a 2 hour journey) to drive to Glacier Point. 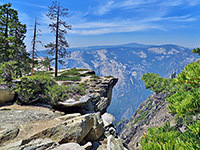 An intermediate overlook (Union Point) is reached after 3 miles, and one continuation is to use the end of the Pohono Trail to reach 8,122 foot Sentinel Dome. As the lower part of the Four Mile Trail is through woodland and the cliffs face north, it receives limited direct sun and is often quite damp - conditions which attract a lot of mosquitoes. McGurk Meadow 1.8 200 The Glacier Point road passes through thick fir forest for all of its 16 miles, with distant views only at the very end. One of several trails through the woods begins about half way along the road, opposite Bridalveil Campground, and descends gradually to a tributary of Bridalveil Creek, at the east end of McGurk Meadow - a marshy clearing in the woods filled by tall grass. Near the stream is an old log cabin. From here the path is relatively flat, past more trees to a junction with the Pohono Trail. Mono Meadow 5 800 Passing over varied terrain of thick forest, open slopes, rivers and meadows, with frequent views over distant granite mountains, the Mono Meadow Trail is a pleasant if little used route. The path starts along the Glacier Point Road and descends 300 feet to Mono Meadow, a long, thin, sometimes marshy clearing along a tributary of Illilouette Creek. Next is a traverse of a less densely wooded hillside, a descent to the main creek, and a crossing of the Buena Vista Trail. The final 2 miles is a gentle climb over open ground on the western side of Mt Starr King to a junction with a connecting trail that in turn meets the Panorama Trail after another 0.5 miles. Ostrander Lake 4.8 1,500 The path to Ostrander Lake branches off the Bridalveil Creek Trail after 1.5 miles, follows the wooded creek for a while on the north side then begins to ascend quite steeply up Horizon Ridge, into more open land with large exposures of granite. The path continues climbing to a small summit at 8,600 feet, before ending with a short descent to the north shore of the lake, a point 6.3 miles from the start of the hike along the Glacier Point Road. Panorama Of the three trails that start from the end of the paved road to Glacier Point (Pohono and Four Mile being the others), the Panorama Trail is generally thought to offer the best views. 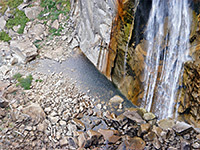 It heads southwards across sparsely wooded slopes high above Illilouette Creek, switchbacks down to a footbridge over the waters (and passes a viewpoint of 370 foot Illilouette Fall), follows close to the rim of Panorama Cliff then descends steeply again towards the Merced River, joining the John Muir Trail just above Nevada Falls. All of the path offers incredible views over waterfalls, Yosemite Valley, Half Dome and many other summits. A park shuttle allows the one-way hike to be done without needing two cars, or the path could be combined with the Four Mile and John Muir Trails for a long day trip. Pohono 13 2,800 This long and little used trail climbs to the top of the cliffs on the south side of Yosemite Valley and follows close to the rim all the way from above the Wawona Tunnel to Glacier Point, mostly through the forest though passing many viewpoints of the valley. The west trailhead is at the parking area on the east side of the tunnel from where the path ascends 1,500 feet steeply with many switchbacks then turns east and climbs more gently, soon passing four viewpoints in fairly quick succession (Old Inspiration, Stanford, Crocker and Dewey), before turning away into the woods, passing around several upper tributaries of Bridalveil Creek then on to one more overlook at Taft Point. The final section is past Sentinel Dome (the actual summit is reached by a short spur trail) and on to the parking area at the end of the Glacier Point road. Along the route are junctions with two connecting paths from the road, leading to Taft Point and McGurk Meadow, so allowing for various shorter hikes. Sentinel Dome 1.1 400 Sentinel Dome is a typical Yosemite summit of bare, rounded granite, rising above the trees near the end of the road to Glacier Point. An easy trail winds not too steeply up a partially forested slope to the top, which has an unobscured, 360° view over the surroundings, this being the highest point for some distance in all directions. An even shorter way to the summit is to walk along an old road, starting about half a mile east of the official trailhead, which reaches the top after 0.5 miles. Taft Point 1.1 240 Offering an alternative to the often overly busy Glacier Point, Taft Point has equally good views over Yosemite Valley, 3,500 feet below, and of some nearby rock formations known as the Fissures. The trailhead is the same as for Sentinel Dome, about 2 miles before the end of the Glacier Point road, and the path is an easy walk through open woodland, reaching the edge of the cliffs after just over a mile. Near the rim is a junction with the Pohono Trail, that leads to other not-often-seen viewpoints both east and west. Westfall Meadows 3 680 Like the trail to McGurk Meadow, which starts on the opposite side of the highway, close to the Bridalveil Campground, the Westfall Meadows Trail is an easy route to quite a large meadow, enclosed on all side by thick pine woods. 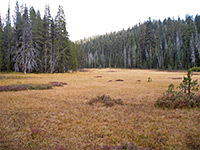 The meadow is only 1.5 miles from the road; at the far side, the path enters the forest once more and descends into the upper end of the Alder Creek drainage where it meets another trail from Wawona.